For years, people have questioned the work of J.D. Salinger, always wondering if the famous author of The Catcher in the Rye secretly had any other work to offer the literary world. At long last, we may finally find out. According to Huffington Post, a new biography and film about the life of J.D. Salinger are set to be released in the next year. Simon & Schuster recently acquired The Private War of J.D. Salinger, an oral biography put together by David Shields and screenwriter Shane Salerno. A documentary about the author is set to air on PBS’s American Masters series next January. Salinger died in 2010, and an authorized biography is yet to be released. Very little is known about the author, and it’s still not entirely clear whether or not the biography or film will include details about possible other work from the author. But it’s likely to tell an historical tale as well, as Hillel Italie explains. It sounds interesting, but the real question is whether or not Salinger has a secret, unpublished manuscript. If so, will it be released? And would it top The Catcher in the Rye? Or is it best left undiscovered? Celebrities seem to constantly be publishing memoirs these days, don’t they? But few of them have us as excited as this one: a memoir by SNL and Parks and Recreation star and comedienne Amy Poehler. According to Entertainment Weekly, Poehler has a deal with It Books to release her first book sometime in 2014. It Books is an imprint of HarperCollins. Not much is known about what the book will include, but I’m sure if it’s anything like Tina Fey’s Bossypants, it will sell like crazy. If you’ve ever read Something Borrowed or Something Blue, then you probably love author Emily Giffin. She’s the bestselling author who wrote those novels, and a handful of others about modern-day love — a bestselling chick lit novelist, if you will. So if you like her work, it’s worth picking up a copy of Love the One You’re With. It tells the story of a happily-married woman, who somehow gets back in touch with one of the bad, but tempting boyfriends of her past. It’s a story about love, loyalty, and growing up. Who will she choose? Will it be the right choice? Emily Giffin has a way of writing books women simply can’t put down, and now Love the One You’re With is available on the cheap. Get Love the One You’re With in paperback for just $5.58. 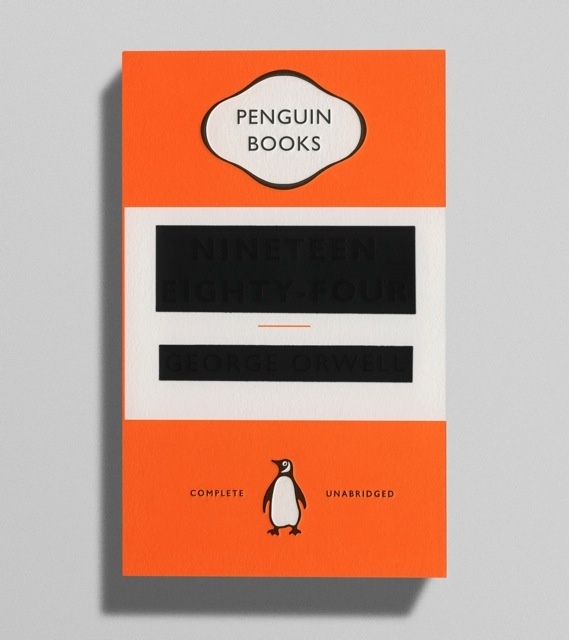 Penguin Books recently redesigned the covers of its books by George Orwell. But it’s arguably Orwell’s most famous novel whose new cover stands out among the rest: 1984. It’s always an odd feeling when you learn that one of the greatest authors of our time maybe wasn’t as great as we thought he was. That’s what happened with John Steinbeck recently. According to the L.A. Times, the 1962 Nobel Prize winning author of novels like The Grapes of Wrath, basically won the prize by default. Once a person wins the Nobel Prize, the deliberations of the Swedish committee have to be locked up for 50 years in Stockholm. They were recently released, and revealed a lot more about the selection process than people expected — and not in a good way, for Steinbeck anyway. Hector Tobar explains. Graves was rejected, Schueler reveals, because as an English-language poet he couldn’t match up to the great Ezra Pound — and Pound’s record of anti-Semitism and support of fascism would forever disqualify him from winning […] Danish novelist Karen Blixen was also a finalist, but she died a few months before the selection committee’s final meeting. Anouilh was likely passed up because a French poet had won the award in 1960 and because the committee was seriously considering Jean-Paul Sartre, who would win the award two years later. In fact, the papers even say there wasn’t any “obvious candidate.” Ultimately the committee nominated him, determining that his most recent books included some of the greatness of his earlier works. It’s rare when a self-published book is sought out by a major publisher for distribution. But that’s what happened with TV critic Alan Sepinwall’s book, The Revolution Was Televised. According to The New York Times, Sepinwall, who’s currently a TV critic for the web site hitflix.com, shopped his book around early last year but only got one offer — which he didn’t think was very good. Instead of goin that route, Sepinwall self-published the book. In it, he explains the impact that a select group of TV executives and TV shows — The Sopranos, Mad Men, Friday Night Lights, Lost — had on the television industry and the long-form drama. Now the Touchstone imprint of Simon & Schuster has picked it up, with plans to release it in paperback in the early spring and in e-book format possibly earlier. The book also received a lot of praise from The New York Times. I’m almost as a much of TV nerd as I am a book nerd, so I’d really like to read the book. It will be interesting to see how much money the book will bring in, now that it will be so much more accessible. Don’t want to wait? Get The Revolution Was Televised in paperback now for $16.99..
Or get it on your Kindle for just $6.99. When a romance movie is based on a nonfiction book, and when books tend to be better than the movie version, one would expect the book to be as gushingly romantic and heartwarming as they come. Such is not the case with The Vow. To be fair, I went against my normal ‘Movie vs. Book’ review ways and saw the movie before reading the book. (Usually I force myself to wait to see the movie until I read the book.) That being said, I wasn’t a big fan of either the movie or the memoir. Admittedly, they tell an amazing true story of a recently married man and woman, Kim and Krickett Carpenter, who get into a horrific car accident. Krickett suffers from a severe head injury which causes her to forget the past year-and-a-half of her life. Unfortunately for her husband, Kim, that year-and-a-half is the same time period when the couple met, dated, fell in love, and got married. Suddenly, Krickett does not remember who her own husband is. Through all the therapy, Kim decides not to fix his marriage, but to recreate it by making Krickett fall in love with him all over again. It is such a beautiful story, and the fact that it’s true makes it even better. That’s why, after reading the book, I had a lot of problems with the movie, which stars Channing Tatum and Rachel McAdams. The movie fabricates much of the story by creating odd and mostly unbelievable subplots. For instance, in the movie, Rachel McAdams’ character hadn’t spoken to her parents or high school boyfriend in years, so when she recovers from the accident and wants to be with her parents, it’s odd. Channing Tatum’s character is forced to not only make his wife fall back in love with him; he also must remind her why she hasn’t spoken to her family in years. The book, which is written by Kim Carpenter himself, includes nothing about this — because that wasn’t the case at all. Krickett had a very healthy relationship with her parents, who were supportive throughout the whole ordeal. Despite what the movie makes you think, there was also no point in time when Krickett almost got back together with her ex-boyfriend. That’s not to say the book doesn’t have its own issues. Because it’s written by Kim Carpenter — who’s not an author — the story is told very clinically and leaves out much of the expected romantic details and emotion. Instead, it focuses on Krickett’s recovery and the couple’s faith in God. But he also gets rather preachy toward the end, emphasizing the importance of believing in God. While the book excludes some of the true emotion between Kim and Krickett, the movie falsifies and fabricates much of the story. After reading the book, the movie seems unbelievable — the opposite of what you’d want after watching a movie based on a true story. Get The Vow in paperback now for $8.49. Or get it on your Kindle for $7.50.